I. Meditate 3-5 times on Ephesians 2:1-10 this week. II. Read the blog “Outreach and Warfare” paying special attention to the metaphor Argument is War and write some observations/reflections down. III. 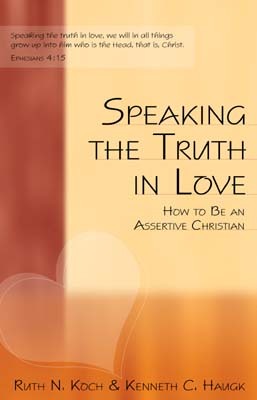 Read Speaking the Truth in Love, Chapters 12-16. Give yourself plenty of time to digest each chapter before moving on to the next. Write down some of your thoughts and reactions. IV. Take some snapshots of your week. Write out 2-3 “verbatims” of conversations or interactions you had or observed, this week or recently. Write down as exactly as you can remember everything that was said, with specific words and phrases. Evaluate to see if you can identify passive, aggressive, or assertive language. Did the Argument is War metaphor find its way into your conversations this week? How might these conversations have gone differently? Be prepared to share. Looking toward new relationships. Share some thoughts on who you might like to invite to join you for your next triad experience. Who might you invite and why? Interact with the material. Which chapter seemed easiest to implement? Which is most difficult? Is yours different or the same as the others in your triad? Do you have any sense of why that is?Share your verbatims and talk about the good, the bad, and the ugly. Make sure you interact with each other in ways that care instead of cure, and watch out for the feelings of defensiveness or the need to counter attack even in the midst of your meeting! Prayer. Pray specifically for the people you are thinking about asking to be in your next triad team. Pray for one specific area in your own life in which you are seeking God’s grace and His power to mold, shape, or change you.